It all started with a Facebook post from my friend Whitney a couple of years ago: If you spend 10 mins a day learning about a topic, by the end of the year, you can be an expert in it. At first I was like, nah, but then it got my brain rattling. So then I started thinking about all the great FREE ways we can learn something because of the internet and opened myself into the possibility that it might be true. Between videos, blogs and podcasts, I could learn all sorts of stuff. I don’t know how I stumbled upon them but I got hooked on MOOCs (Massive Open Online Course)and now I am a big fan of them. I am always excited to learn something new or to deepen my knowledge on a topic and these classes are from legitimate institutions like universities. It’s like a FREE college course without textbooks or fees. Some of my favorite MOOC providers are listed in this Wikipedia article. Currently I am spending this upcoming year enhancing my leadership skills and Coursera has several offerings on meaningful topics for my professional development. I have decided to take a Personal Branding course and its actually really fascinating. And I have to agree with the thought leader, Glenn Llopis: “If you can’t live your authentic identity, then you’re living someone else’s perception of you.” Boom!–That’s truth. So if you don’t get clear on your personal values, then you don’t who you are and what you represent-as a leader or otherwise. And when you know your personal values, then it’s easier to make decisions and set goals. So I guess in the New Year, I get to be a new me–understanding Who I Am and how I can develop a mindset that…. and I begin to …. And how do I accomplish this?– dedicating at least 10 minutes a day to learning and discovering. Get ready 2016–it’s gonna get Transformative!! Happy New Year! My family and I had an enchanting time in Hong Kong and revealed in all the sweet moments we had through our travels. It made me consider how abundant my life is and how lucky I am. And with all the VPN-free browsing, I could catch up on all the blessings and challenges of loved ones on Facebook. In fact two posts stirred my imagination as I began to consider what and how I wanted 2016 to look for me and my family. 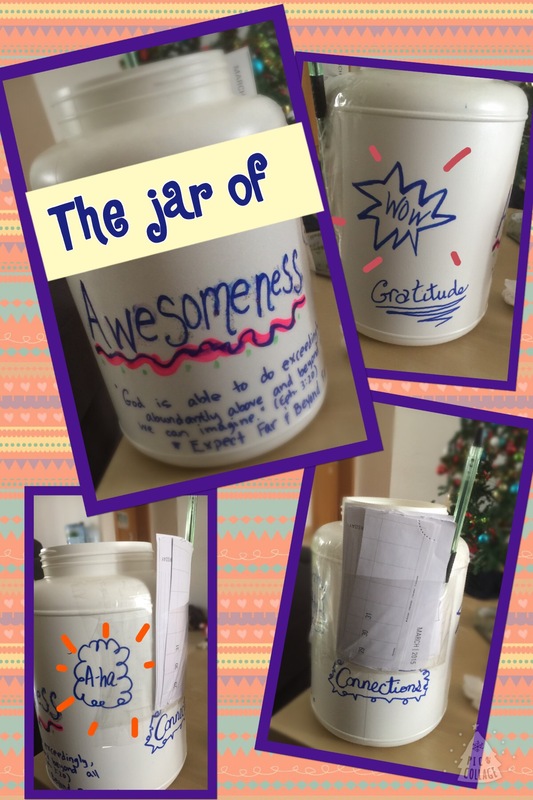 It started when I saw my sister post an idea about a”Gratitude Jar”- a large mason jar that one could write all the things that gave them a sense of gratitude. Later I saw that one of my friends had actually done that and was going through all the events that she documented as a part of her New Year’s Eve ritual. That sounded like such a cool way to ring in the New Year and it got my mind rattling off the possibilities. I know where attention flows, energy flows. And if I wanted to upgrade my mindset in 2016, creating more joy and abundance, then this kind of tool would be perfect to help me do this. However, I wanted to take it a step further, beyond gratitude alone, and explore the realms of wonder and awe. I wanted a Jar of Awesomeness- to document the many moments in which my breath is taken away and I vibrate with unexpected joy- Miracles! Furthermore, I didn’t want these episodes of miracles to be limited to a quaint mason jar. I wanted enough space, sort of speaking, to document these moments of Divine connection. So I found an old protein shake container-3x the size of the large mason jar- to begin this new habit of exploring the AWESOMENESS. Already have a few ones in there from our trip from Hong Kong and I look forward to filling it up.